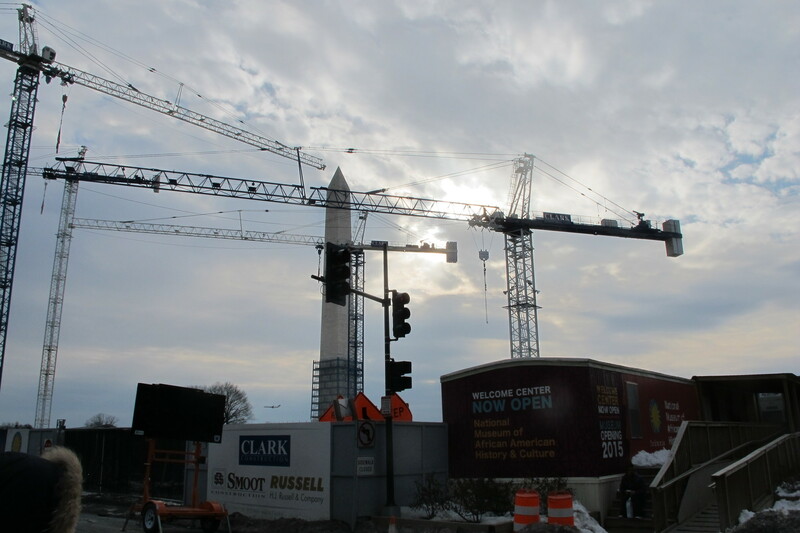 The location was on the corner of the National Mall at 4th street NW. The "Take It!" came from having driven by this location the day before. It was not on our usual route - so offered some different items to look at. 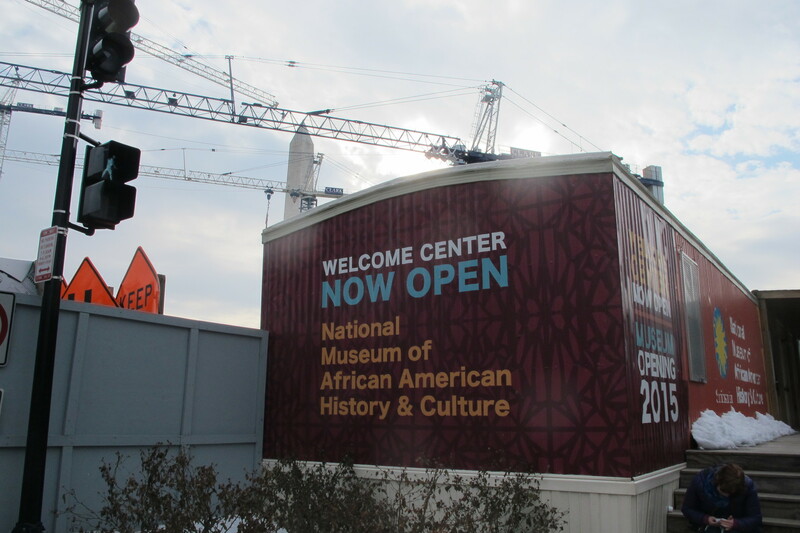 This is the corner on which the new African American Museum is under construction. 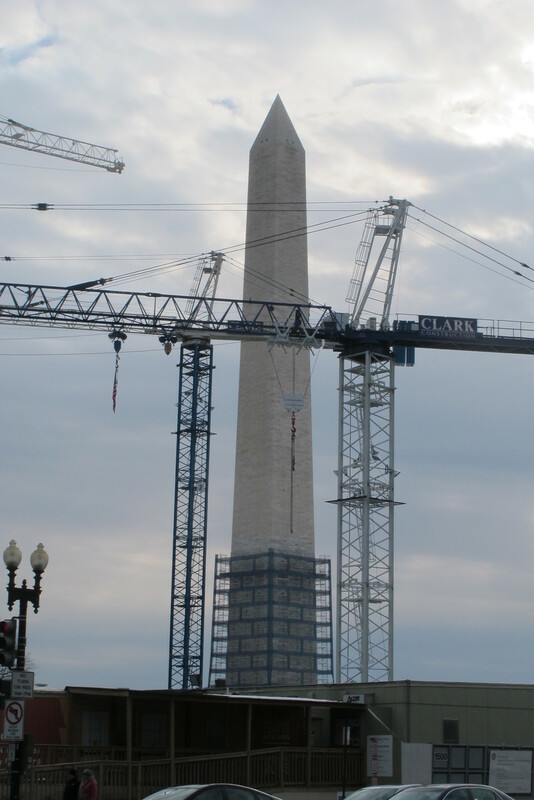 They have put the construction cranes into place which offer no competition to the Washington Monument - only some supplement. 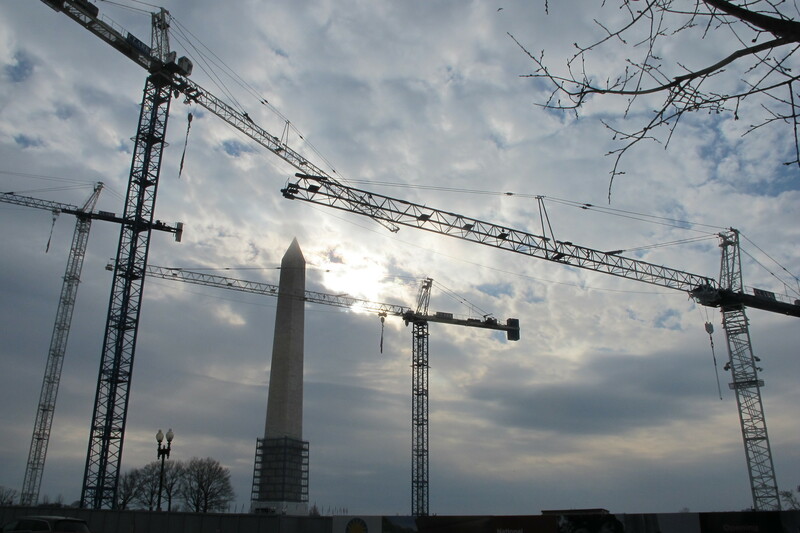 In the instance of the upper photo - It reminded me of a rocket launch site when using the cranes as borders for the monument. The other photos are to give some context for the setting for it looks like this is going to be a very large structure. I have a sense that it is going to be very well attended once it is open. The After Take: Everyone seemed to get a laugh out of my quoting the label for featured photo. The comparison to a rocket launch setting was immediately recognized and from there the questions flew about what was going on. There are many of us that while living here - do not visit the Mall on a regular basis to keep up with what is happening. I think this happens to most of us as we get into the regular routine of going to and from work and if the path that this takes does not take us by local landmarks we can almost get out of touch with them even though we live in the same town. I confess to having been surprised at seeing the cranes in this location. I am giving serious consideration to setting up some sort of get off the beaten path date on a regular basis to give me a better chance to keep me familiar with my own city. It can be at any time of year for each season can bring a different way of looking at the same thing. Here is hoping you agree that the count down as the label for this had to end at the half way mark for we would never want this great symbol of our country to take off for parts unknown. By the way. I do not know if everyone saw this monument when it was fully encased in the scaffolding when it was being repaired from the damage from the recent earthquake. I must say it looked very cool when it was lit up from the underside of the plastic they surrounded it with in order to be able to work on it and keep it dry while doing so. It looked very cool indeed. PS: Several who looked at the upper photo - thought that I could crop it and have the crane booms become an illusionary shore line for a body of water and the monument take on a sort of reflective appearance. Perhaps we will try that at a later time and give that photo a different name. HAHAHAHAHAHA I can see it. Monument headed to the international space station, I can see it now. Looks like they are really working hard to get that museum done. Thats cool, it does look like a makeshift Houston launch. Oh cool a new Smithsonian is coming in 2015. I didn't know, thanks for the photo....learn somethin new everyday. BTW Thanks for the prize! I will email you when I get home and try them. The first picture is epic. Its really cool to see the different things you see when looking at them from a different perspective. The 2nd picture almost looks like the cranes had moved. @Yuppie7 LOL Just a big monument jutting out the side of it. I go to DC every year as part of my schools 9th grade trip. It'll be nice to FINALLY have something new to see.